In the past I tried several different note tracking tools, most notably the great org-mode. I like the concept of keeping all my personal notes locally into plain text files. The problem I have with org-mode is that it only works with emacs, while I prefer to use vim. Following the unix philosophy, I think the most important is not the tools used to process the data, but the way we store them, and plain text is obviously superior to anything (note: xml is not plain text!). For example even though I don't even use emacs anymore, I can still open and read my old org-mode files, and I know I always will. All my notes file are stored locally on my computer in the directory ~/Notes. Some of the files have special meaning, for example ~/Notes/todo.txt contains my to-do list. 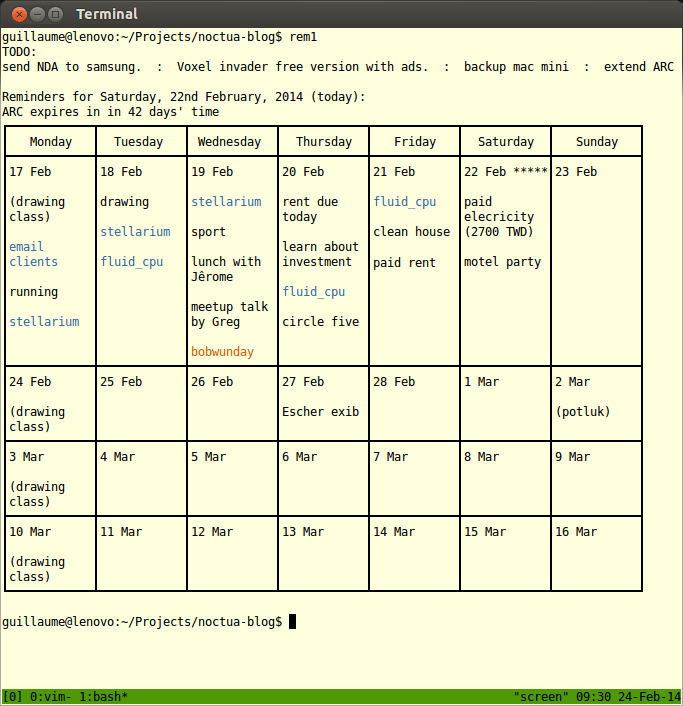 I also have one file per day for my diary and schedule, stored as ~/Notes/days/yyyy-mm-dd.txt. It can get much more complex than that, for an comprehensive documentation refer to the man page. Of course I do not want to change the format of my note files to accommodate any special tool. Instead what I did is write a small python script that parses my files, generate the corresponding remind file, and then invoke remind on it to show me the nice output you can see in the beginning of this post. I am quite satisfied with the result. I think many people do not want to use remind because of the forced syntax, but once you use it as an intermediary step in the process of managing your note files it can come in handy.